Washington, DC: The Pell Institute of the Council for Opportunity in Education and the Alliance for Higher Education and Democracy. 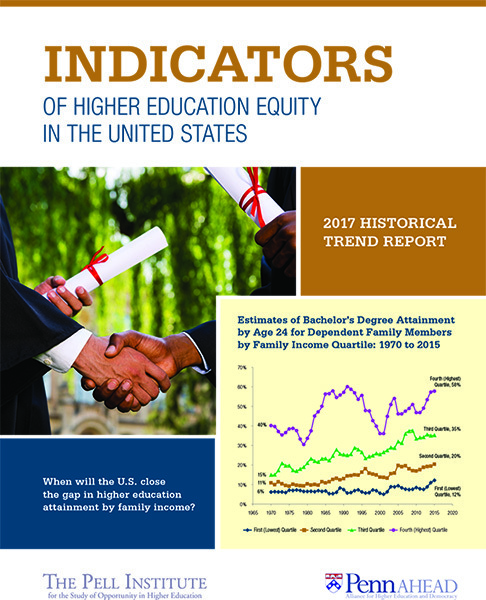 Cahalan, M., Perna, L.W., Yamashita, M., Ruiz, R., & Franklin, K.
Indicators of Higher Education Equity in the United States — 2017 Historical Trend Report (http://pellinstitute.org/indicators/ )is a joint publication of the Pell Institute for the Study of Opportunity in Higher Education (Pell Institute) at the Council for Opportunity in Education (COE) and the Alliance for Higher Education and Democracy at the University of Pennsylvania Graduate School of Education (PennAHEAD). The report compiles data from the nationally representative government statistics, including the Census Bureau household studies, and the National Center for Education Statistics (NCES)-sponsored high school and college longitudinal studies, which track college entrance and completion by family income, socioeconomic status, and race/ethnicity, with the goal of increasing our understanding of issues of equity of access and outcomes in higher education.